Warmer weather conditions in western Greece have led to the eerie spectacle of a 300m-long spiderweb in Aitoliko. 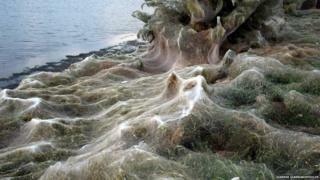 Experts say it is a seasonal phenomenon, caused by Tetragnatha spiders, which can build large nests for mating. She told Newsit.gr: "It's as if the spiders are taking advantage of these conditions and are having a kind of a party. They mate, they reproduce and provide a whole new generation. "These spiders are not dangerous for humans and will not cause any damage to the area's flora.